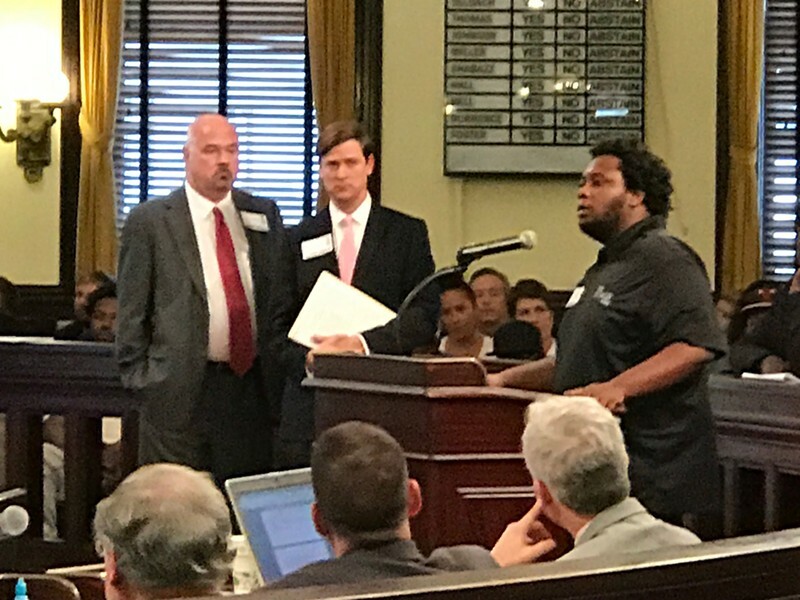 The Stage On Bay owner Charlie Schmitt stands with attorney Will Claiborne as West Savannah resident Charles Brown speaks in support of the project at today's City Council meeting. IN A remarkable development at this afternoon’s regular meeting, City Council voted 8-1 to deny an alcoholic beverage license to the new West Savannah music venue The Stage On Bay, slated to hold its first concert tomorrow night, Feb. 3. This evening The Stage On Bay announced the Friday night show has been moved to the Lucas Theatre for the Arts downtown, which will honor all previously purchased tickets. Only Alderman Julian Miller voted to support The Stage On Bay liquor license, on the basis that the City has no legal standing to deny it – an opinion confirmed even by several other Council members who voted against the venue. The hearing had been held over from two weeks prior to give owner/operator Charlie Schmitt time to meet with the Hudson Hill Neighborhood Association, many members of which are firmly opposed to the venue, citing parking problems and disruption caused by concertgoers. While more neighborhood interaction took place in the meantime, it wasn’t enough to assuage the concerns of residents, who eventually swayed Mayor and Council to their side even though a possibly successful lawsuit against the City is nearly inevitable based largely on the fact that zoning currently permits such a usage. Claiborne said the zoning already approves such a usage in the location, and “The City has zero objective data” to indicate there is any reason to interfere with the venue’s right to obtain such a license. Most of City Council recognized on the record the legal dangers of denying the Stage On Bay liquor license – though it did come out in the meeting that the venue hadn’t even been granted a Certificate of Occupancy, meaning the Marshall Tucker Band concert could still have been in jeopardy in any case. Schmitt and Claiborne have both said there has already been over half a million dollars invested into Stage On Bay to improve the former light industrial space. Mayor Eddie DeLoach and AldermanThomas both stated concerns over the continuing lack of protocol involving alcoholic beverage licensing. 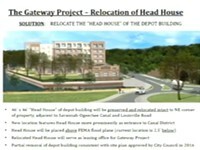 “The reason we’re in this situation today is because nothing has been done in the past,” said DeLoach. He went on to muse, “Alcohol matters really shouldn't come before this body at all,” suggesting that an administrative officer position could be created to streamline the process. Johnson reiterated his previously stated position that The Stage On Bay owner should have tried to open the venue in the Historic District. 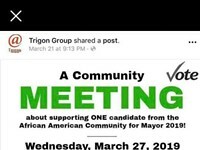 “This venue is a win/win somewhere else, but a lose/lose in this location,” said Johnson, widely considered to be mulling a mayoral run in the next City election. 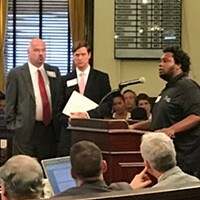 However, as several neighborhood leaders took to the podium to address Council stating their opposition to the venue’s liquor license, most City Council members did an about-face from what they’d just said. Just before the vote was taken, Thomas said he would vote against the venue even though he knew the City would be taken to court. He also urged Schmitt to consider moving The Stage On Bay to a different location. He did so without mentioning all the investment that had already been made. Alderman At Large Brian Foster, who had also previously said there was little standing to deny the license, stated before the vote that nonetheless he would also "support Van" and vote to deny it.